I've grown Jalapeno peppers for around the past 3 years. 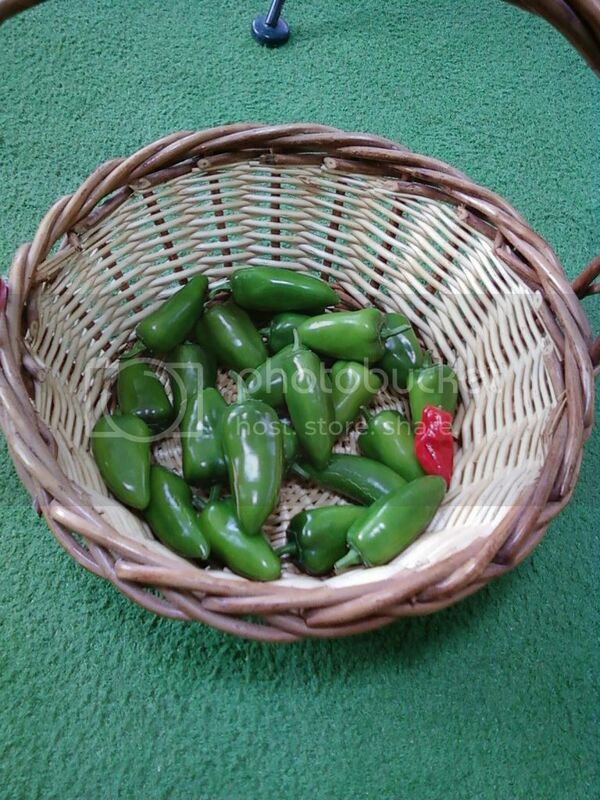 The very first summer, they grew like wildfire and I couldn't figure out what to do with all the Jalapenos! 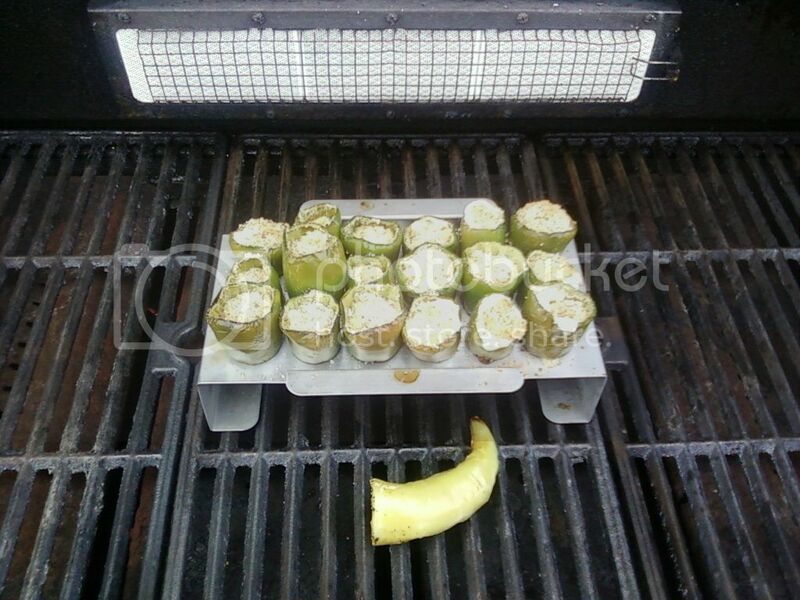 I'd make poppers, sautee them with other veges and even made Jalapeno Jam in the fall. The next 2 summers I planted fewer plants but I didn't really get the same results. I didn't even have enough at once to make a good round of poppers. 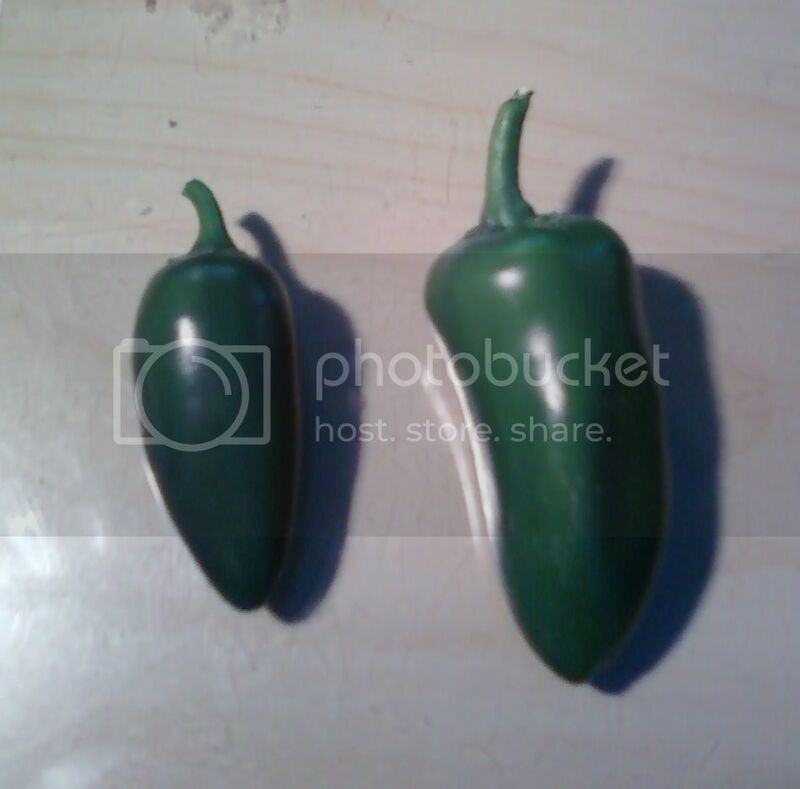 This summer however, I was out at a new nursery and found a "Gigante Jalapeno" variety by Burpee. I picked some up for my dad and myself and thought we'd give them a go. Well, they certainly did turn out Gigante! I made a first batch of poppers last weekend and they were delish! I guess I didn't get a chance to take an after picture because we ate them up so fast! By the way I'll take 2 of what's on the grill, please. Where did you find that rack at? I love this thread. 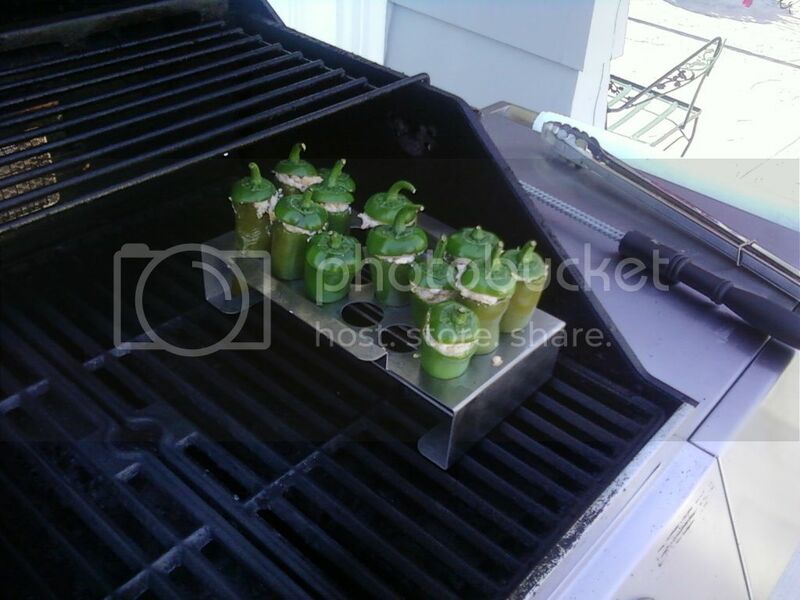 Love the grilled peppers pics. Got it at Williams and Sonoma. 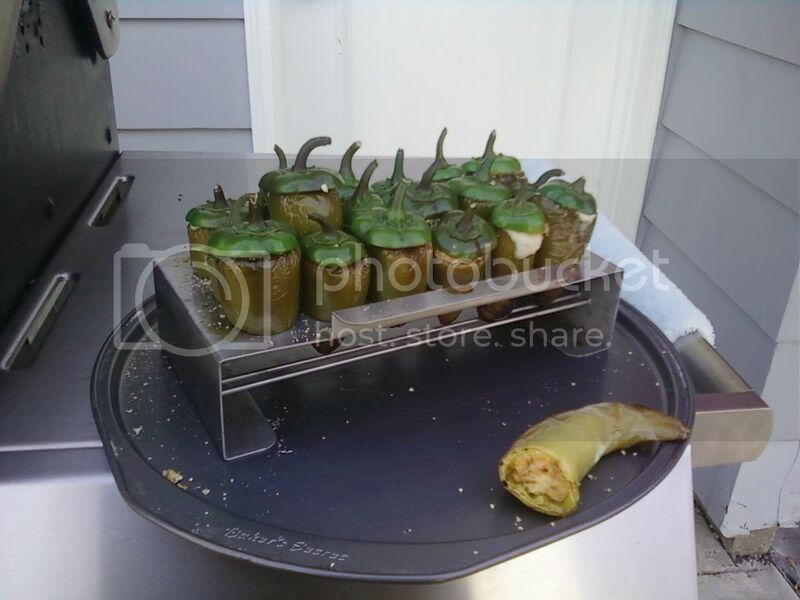 They also sell a Jalapeno corer. If you are growing normal size peppers, the corer is way too big. If you are doing the Gigante size, it works really great. My basic recipe is about 4 ounces of cream cheese with 4 ounces of shredded cheese (Monterrey jack is pretty good). Then I add some sour cream to taste, some diced olives (bit of extra juice to make it tart), and a small bit of cilantro (again to taste). Then I put it in the fridge for a bit to let it harden up. I use my hands to roll bits of the mixture into a little log. Then I slide the logs into the peppers. The mixture melts nicely when placed on the BBQ. I also pre cook the peppers with no mixture first. Tomorrow I plan on trying a new spin on this. I'm going to take the logs and roll them in some bread crumbs (and maybe parm cheese) before I put them in the peppers. I also saw a recipe where you beat some eggs, mix it with salsa and cheese and then put it in the peppers. Sounds like a Jalapeno pepper omelet to me! Might add some chopped green onions to it. Mmm. I managed to pick around 25 peppers today so there'll be lots of experimentation! Yours look really good and tasty, and the size is goliath..I always luv cooking mine up on the grill also..
As one says there's always next year.. Enjoy.. Your killing me here floorpie. I'm starving and my tummy is growling and mouth watering literally reading your recipe. That sounds super awesome. Jalapenos for breakfast, you bet. Are they packing any heat? 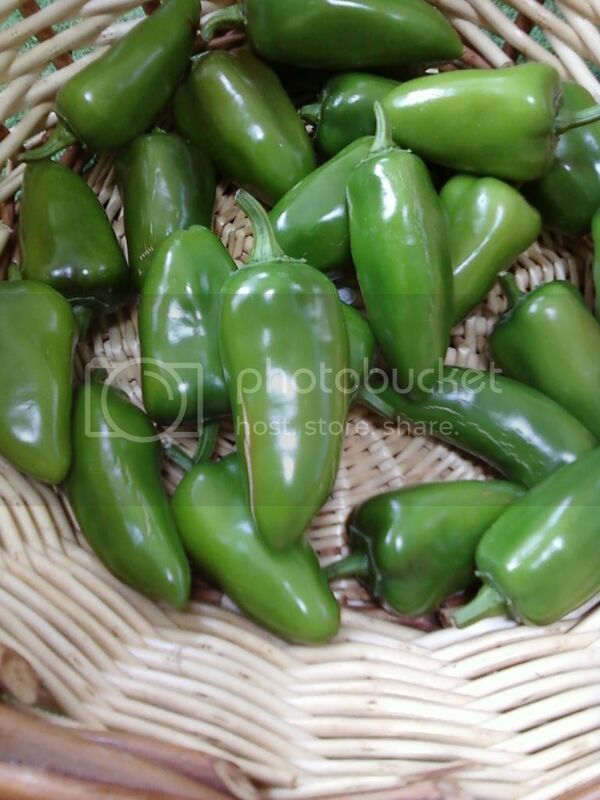 I have found the large Jalapeno Peppers in a local market but they lack any real heat that I associate with Jalapeno's. The ones I grow are much hotter, but much smaller and are great pickled. The last 3 weeks I've averaged eating about a pint of Jalapeno's a week. Glad I have 4 plants in the garden still putting out some. A friend of mine takes a pepperonchini stuff cheese in than wraps with a thin slice of beef tenderloin than a slice of bacon. Put that on the grill and wait for heaven in your mouth. Don't forget the homade dipping sauce that is a secret. Niiice Peppers, and great pics thanks for sharing... your peppers look delicious. I just started my first indoor pepper garden... looking forward to some nice plump peppers just like yours. gixxerific wrote: A friend of mine takes a pepperonchini stuff cheese in than wraps with a thin slice of beef tenderloin than a slice of bacon. Put that on the grill and wait for heaven in your mouth. Don't forget the homade dipping sauce that is a secret. I made another batch of 18 tonight. I didn't get a chance to test my egg and salsa mix as I had too much of the cream cheese and Monterrey jack mixture. The idea I had about rolling the cheese in breadcrumbs/parm cheese before putting them in the peppers was a great one indeed. It even helps keep the cheese together, instead of melting all over the place. I also added some paprika to the breadcrumb/parm mix to give it that smokey, spicy flavour. The peppers aren't really that hot no. They do have a bit of a kick (from what family members have said) but I have a pretty strong tongue and don't notice it much. The corer that I bought really does a good job at getting all the seeds/white flesh out which is where all the heat is contained. I took some more pics and I'll post them tomorrow. I'll have to take some pics of the actual plants themselves too. They are huge. One of them is around 4 feet tall already.